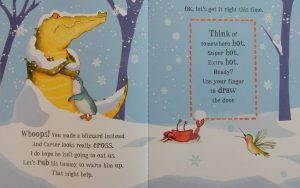 There’s a cranky croc in this book and he needs you! Can you help Carter the crocodile find his way home? Carter can’t find his way home in this lovely story with a wonderful interactive narrative. He tries all sorts of doors with help from the reader, leading to the ocean, snow covered land and even the desert! He’s a little bit cranky so the little animals joining Carter on the way must watch out for his teeth! But it’s the reader who has to think very hard and use their imagination to help find Carter the right home. What’s Next Door? is a sweet tale about finding home, featuring Carter the crocodile who we first met in Open Very Carefully. With die-cut pages and colourful illustrations and a totally engaging narrative, young readers will love being involved. From creating the ‘doors’ with their fingers, tipping the book to help Carter on his way and even some clapping, What’s Next Door? is fully interactive and bound to have your little ones asking for it again and again.